GEN COCKTAIL-NAP Cocktail Napkins Bev-Naps Beverage Napkins, 4,000 ct, RPPsupply House Brand. These Beverage Cocktail Napkins are great for use in Adult or Child Daycare, Preschool, Montessori & K-12 Schools, Hospitals, Group Homes, Assisted Living, & Home Use. Stay within budget with these excellent Bev-naps. Absorbent paper provides high-quality performance. These Cocktail Beverage Napkins are great for use in Adult or Child Daycare, Preschool, Montessori & K-12 Schools, Hospitals, Group Homes, Child Care Centers, Assisted Living, & Home Use. Great Quality & Economical! These make great napkins for Daycare Centers because Small Hands need Small Napkins!! 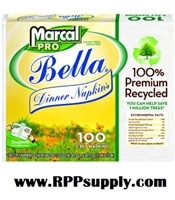 RPPsupply House Brand Items, are typically Good Quality Economical Alternatives to Name Brand items. RPPsupply House Brands fluctuate from time to time, pending on Market Conditions, Global trading, Supply Availability, etc, etc, etc. Includes 4000 napkins each case. Stay within budget with these excellent luncheon napkins. Absorbent paper provides high-quality performance. & Home Use. Great Quality & Economical! Handy packaging feature makes dispensing quick, easy and convenient. Two-ply. Attractively embossed with flower and coin pattern. Includes 30 packs of 100 each.